Getting quotes from multiple packing and moving companies in Denver is incredibly important. If you’ve had a chance to read our previous blog about how to find the right local movers, then you already know about the steps you’ll need to take to find the right local moving company. The last step we mentioned was getting and comparing quotes from multiple moving companies. Binding Estimates – With a binding estimate, the mover is required to honor the estimated price, but only as long as nothing changes. Non-Binding Estimates – Think of a non-binding estimate as the moving company’s best guess as to what your move will cost. The actual cost of the move will be determined by the weight of your possession, as well as the services that were provided, and could be much higher than a non-binding estimate. Binding-Not-to-Exceed Estimates – A binding-not-to-exceed-estimate is a lot like a binding estimate, only you’ll pay less if your possessions weigh less than estimated. Why is it important to get quotes from multiple movers. #1. Develop a realistic budget for your move. Moving can be expensive, and in order to avoid spending more than you want to or can on your move, you’ll need to have an accurate moving budget, which, of course, will greatly depend on the cost of hiring movers. If you already have a budget, getting multiple quotes will help you determine if it’s realistic or if it needs to be adjusted. And if you don’t yet have a budget, it will give you an idea of how much it should be. #2. Get a good idea of average costs in your area. If you get just one moving quote, you’ll have no idea if it’s high, low or average for the costs in your area. In general, when you get multiple estimates, you can expect that they’ll be roughly the same. However, if one estimate is much higher or lower than the others, you can take steps to find out why. If the estimate is overly low, maybe the company is fairly new and trying to attract new business, or maybe it’s low because the company isn’t properly insured or licensed. If the estimate is overly high, maybe the company offers additional services or uses higher quality packing material, or maybe they’re just trying to swindle you out of your money. #3. Better compare moving companies. Getting an estimate is a good starting point for comparing moving companies. Having multiple quotes will help you choose which company fits in your budget to hire. And if there are several companies to choose from, you can use other factors to choose which one is right for you, like the services they offer, the amount of experience they bring to the table, the kind of customer service they offer, etc. While there are many respectable, honest moving companies out there, that’s not the case for every moving company. Some companies are there to take advantage of their clients, and they’ll often lure you in with a super-low estimate and then hold your belongings hostage until you pay a higher price that wasn’t included on the quote. 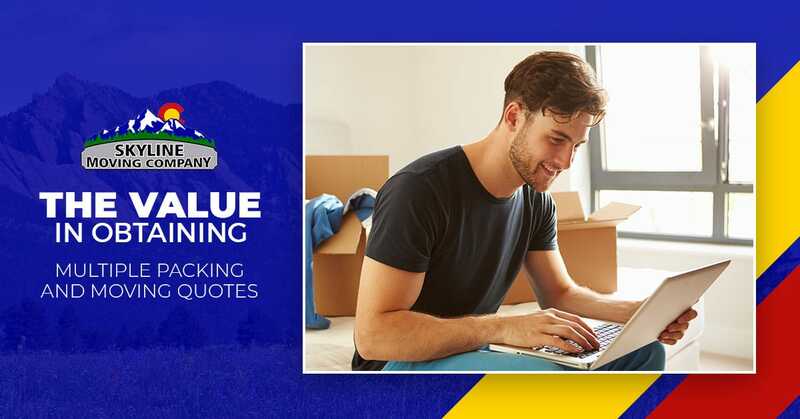 When you’re getting quotes from moving companies, avoid any movers who ask for an overly large deposit, who ask you to pay for the full move upfront and who are only unwilling to give you an in-home estimate rather than over-the-phone. Contact us today for your free packing and moving estimate in Denver! Now that you know about the different types of estimates and why it’s important to get multiple, contact us today at Skyline Moving Company for your free estimate. We serve residential and commercial customers in Denver and in Northern Colorado.